The littoral combat ship USS Fort Worth (LCS 3) participates in a combined formation of U.S. and Bangladesh naval ships during Cooperation Afloat Readiness and Training (CARAT) Bangladesh 2015 in the Bay of Bengal on Oct. 1, 2015. US Navy photo. THE PENTAGON – A recently completed review of how the Navy intends to man, train and equip the two variants of its Littoral Combat Ships is a departure from the more than decade-old original vision of the class. Gone is the emphasis on modular systems and crewing, a complicated manning arrangement that would have three crews rotate between two hulls and mixing the two different types of hulls in East and West coast homeports. 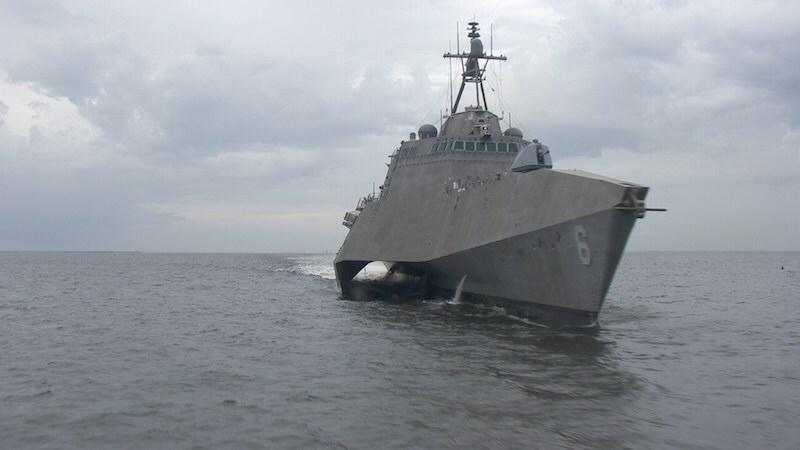 Instead, the Navy will divide 24 planned LCS into six divisions of four ships each – three divisions of Freedom-class ships based at Naval Station Mayport, Fla. and three divisions of Independence-class LCS based at Naval Station San Diego, Calif. – commander, Naval Surface Forces Vice Adm. Tom Rowden told reporters on Thursday. Each of the divisions will be tasked, crewed and equipped with a specific LCS mission – mine countermeasures (MCM), surface warfare (SuW) and anti-submarine warfare (ASW). Each hull will be manned by two crews – blue and gold – like the service’s nuclear ballistic and guided missile submarines. Additionally, the first two ships in each class will be assigned as training ships. “You take the first four ships out of the rotation and you single crew them with senior experienced Littoral Combat Ship sailors and you focus those four ships – Independence, Freedom, Coronado and Fort Worth – on testing,” Rowden said. The remaining ships will then cycle to forward deployed locations with the two crews swapping roles every four to five months. The new crew arrangement will have a core crew of 70 sailors that will be trained to conduct one of the three warfare missions and a 23 person air detachment for a total of 93 sailors aboard. Previous to the new results, the ships were crewed with a hull specific crew of about 40 with a fly-on crew to man the various mission packages plus the air detachment. The crew size for the 3,000-ton hulls is close to the maximum each design can berth – 98 – according to a 2013 Navy LCS manning study. Rowden said the ships could be forward stationed as long as 24 months at a time as a “stretch goal” which will be determined as the service learns the tolerances of the two classes as the ships continue to deploy. “For those deployable ships, they will be deployed a greater amount of time then they will be in refit,” Rowden said. 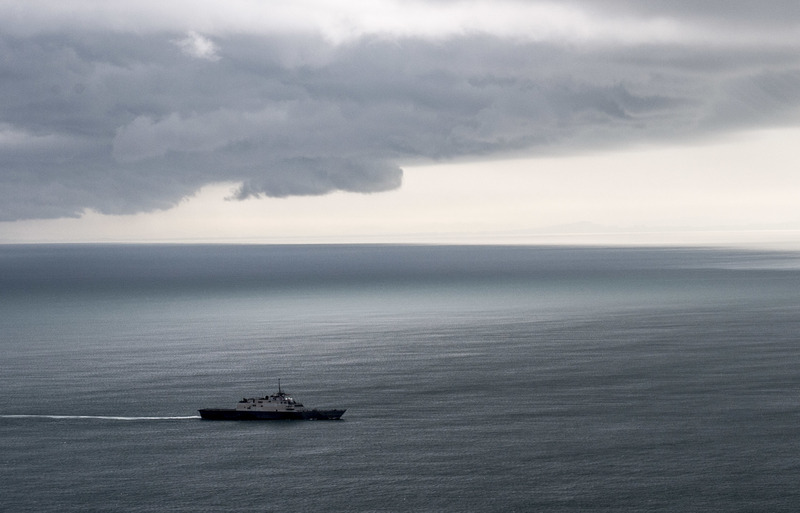 Maximizing operational time for LCS was the reviewers’ “North Star,” according to documents the Navy used to brief internally and to other agencies, several sources told USNI News. Unlike a traditional destroyer or cruiser designed to operate forward about 20 percent of the time between maintenance periods, the less complex LCS was planned to be operationally available for up to 50 percent of the ship’s life. While the review is complete, lingering questions for both Flight 0 LCS classes remain, including how many mission packages the Navy will ultimately buy – the program of record is 64 – and if all of the ships in each division will feature an over-the-horizon missile. Rowden said the details on each issue were still being worked out. Also not part of the review is how to deploy, man and equip the coming class of 11 frigates that will be upgunned versions of either the Freedom or Independence class.